Jersey shore gardening can be challenging, but if you confront the limits and potential of the native conditions, and plan accordingly, you’ll have a gorgeous garden that thrives. 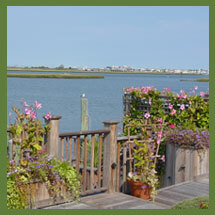 The landscape experts at Bayview Nurseries know the shore can be a hostile environment. Plants need to stand up to wind, salt and sandy soil. Wind: Plants need to be able to stand up to continuous and often strong winds and the sand it carries. Winds can easily damage non-resistant plants. Salt: Sea spray which contains damaging salt can be carried several hundred yards. their thick . Some plants are naturally protected with hard-surfaced leaves, a high gloss or tiny hairs (these prevent the salt from actually touching a leaf’s surface). Plants without natural protection should be sufficiently shielded to prevent the salt’s harmful effects. Sand: Sand does not contain the necessary nutrients for plants to thrive and survive. Jersey shore gardening isn’t limited to just a few choices. There are many salt resistant plants to choose from to create a landscape that you’ll love to come home to. Evergreens such as juniper, barberry and cedar thrive in coastal climates thanks to their hardy foliage and sturdy branches. Another plus: They do well with little water and don’t mind sandy soil. Russian sage, veronica, allium and coneflowers are excellent flowering perennial choices. Many grasses do well and are a natural choice for a seaside landscape. If you want a sure bet for color consider container gardens. You can shade or shelter plants by placing containers against a wall or fence where they aren’t so exposed to the elements. The staff at Bayview Nurseries will be happy to provide you with our extensive list of salt resistant plants. We have over 60 years of experience in landscaping and maintaining properties at the Jersey shore. We’ll be happy to guide you in your plantings or create a beautiful landscape just for you.